Windows SBS 2003 Needs Space on System Partition – Increase Size of System Partition When It Runs on Low Disk Space on Windows SBS 2003. This article will share a third-party partition tool to Windows SBS 2003 users to increase size of system partition when it needs space on SBS 2003. Download IM-Magic Partition Resizer Server to expand system partition size on Windows SBS 2003 when there is no free space on it. The problem of low disk space on system partition continues to be a troublesome issue in Windows SBS 2003, so lots of people desire to look for a good solution to resolve the problem. In fact, only a third-party partition program can help you solve the problem completely. You can use professional partition software IM-Magic Partition Resizer Server to extend the system partition space when it runs on low disk space on Windows SBS 2003. This partition software allows you to extend partition, shrink partition and move partition to reallocate disk space without repartitioning the hard disk. Download, install and launch IM-Magic Partition Resizer Server. 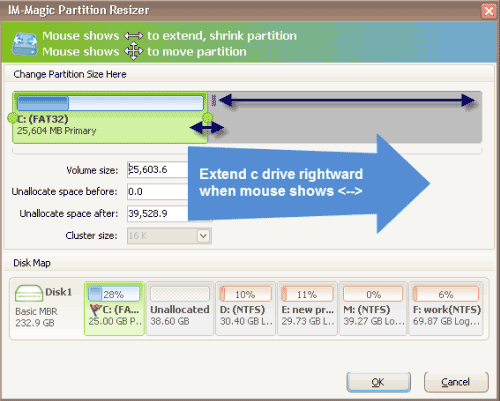 Right click a partition that has free space and select "Resize/Move" option. Extend the system partition by moving arrows and then click "Apply" button. "I installed a 160GB hard disk on my PC that runs Windows SBS 2003, but I only reallocated 20GB space to C drive and now it is nearly full. 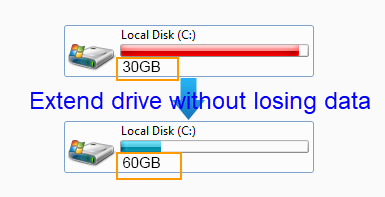 I cannot install any program or save any data to this drive anymore, so I need some more free space to C drive. Can I extend the C drive space on Windows 2003 SBS without touching the data stored on the disk?" "I receive low disk space warning message on system partition on Windows SBS 2003 when I boot my computer. There is little free space on the system partition, so I am searching for a way to increase the size of system partition without affecting the operating system. Can anybody tell me the method to extend system partition on Windows SBS 2003?" Disk Management on Windows PC allows you manage disk in a simple way. For example, you can format partition, delete partition, change drive letter and paths, etc under Disk Management. On some Windows such as Windows 7 and Windows 2008, you can also extend and shrink partition under Disk Management. However unfortunately, you are unable to extend or shrink partition under Disk Management on Windows SBS 2003. Windows SBS 2003 Diskpart can help resize disk partition when there is adjacent unallocated space, but the problem is that Diskpart can only resize NTFS data partition. In another word, you cannot extend system partition by running Diskpart even if there is adjacent unallocated space beside the system partition. All above, both Disk Management and Diskpart cannot help with system partition resizing when it runs out of disk space on Windows SBS 2003. Therefore, you need to rely on partition software to resize the disk partition so as to reallocate more space to the system partition. If you can use professional partition software to perform partition resizing when system partition is running out of disk space on Windows SBS 2003, things will be much easier. First all of, the partition software can work on all Windows Server operating system to resize hard disk without repartitioning. In addition, the partition software supports both system partition and data partition when it runs on low disk space. Therefore, you can fix low disk space on system partition on Windows Server without reinstalling system. What is more, the partition software can extend partition, shrink partition and move partition, you can also merge two partitions in server 2003, so you don’t need to worry there is no existing unallocated space for system partition expanding. By using partition software, you can extend FAT32 system partition without rebooting your computer. The partition software enables you to expand a partition effectively and efficiently without losing any data. In the partition resizing process, the partition software provides safe method to get system partition extended. If the computer turns off due to unknown reasons during partition resizing, you still don’t need to worry about data loss or system crash. The partition software allows you to extend C drive on Windows Server 2003 and Windows SBS 2003.